Patients who have received the arterial switch (Jatene) repair for TGA-D, which is comparatively new, are not expected to have significant cardiac problems during pregnancy. However, those who received the Senning or Mustard atrial switch procedures are at risk of developing right ventricular and tricuspid valve dysfunction as well as arrhythmias, such as atrial flutter. 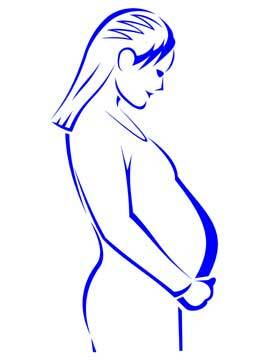 These symptoms will significantly increase the risks of pregnancy. Therefore, these patients require careful evaluation before conception and regular monitoring if they become pregnant. Rastelli patients are also at risk for the development of arrhythmias and may experience left ventricular dysfunction. Therefore, they should be carefully evaluated before pregnancy and monitored closely during it. Generally speaking, patients with repaired D-Type Transposition of the Great Arteries may expect to undergo pregnancy without difficulty if they have no history of arrhythmia, an adequately functioning right ventricle, and no signs of congestive heart failure. There is, however, an increased risk of prematurity or low birth weight. Fetal development will often be monitored through echocardiography (producing an echocardiogram).